1. The EU was very much a background issue in IndyRef 2, with the majority of the Yes camp assuming that Scotland would remain a member after independence. 4. The SNP and the neo-liberals offer their own version of internationalism, an internationalism from above, e.g. involving the EU and NATO. It was important that the Left could counter this with a practical internationalism from below, as RIC did during IndyRef1. 5. If we look at the leading groups on both sides, and compare them with IndyRef1, May's Tories now enjoy an absolute Westminster majority, whereas Cameron was in coalition with the Lib-Dems from 2010-15. The SNP, whilst despite falling back slightly in terms of MSPs at Holyrood in 2016, emerged very much strengthened, particularly in relation to Westminster in 2015 (56 out of 59 MPs), and also throughout civil society. This position could be further strengthened after the May Local Council elections, although the Tories could also well make gains. 6. The SNP leadership were playing things very cautiously, exhausting each parliamentary and legal alternative option in turn, and taking their time before declaring any date for IndyRef2. In the immediate future much SNP campaigning would be focussed on the forthcoming Local Council elections, which would not be over until May. We would then have a clearer idea of the balance of political forces. 7. In the absence of the prospect of an immediate referendum, this meant that RIC had some time to develop a coherent strategy. It was premature in thinking we could recreate a mass movement in the absence of an actual referendum campaign. We should look to get the local groups re-established, initially to take part in a debate over strategy. This would mean taking today's discussion out to the local groups, with the idea of reconvening in August with concrete proposals. 1. How is the political terrain different now than in 2014? How have the political forces involved changed? What are the implications for making radical, left-wing case for independence? 2. The Tories are blocking the referendum. How should we respond? 3. The question of Scottish independence takes place against a background of international crisis and change and the rise of the Far Right. How can RIC factor this into our work in the coming years? 4. What can be done now to practically prepare for a referendum? 1. How is the political terrain different now than in 2014? How have the political forces involved changed? What are the implications for making radical, left-wing case for independence`? It was helpful to go back to 2010, and the election of a Conservative/Lib-Dem government. There had been a sudden spurt of official protests, pushed from below by activists, culminating in the massive public sector pensions strike in 2011. However, the union bureaucrats had sat on all this, defusing the anger. There had also been the big upsurge in student activity, especially the 2011 occupations. In 2012, many of the activists who had been involved in these actions leapt at the opportunity created by the SNP government's announcement of an independence referendum. The space for Left activists to come to the fore was considerably assisted by the SNP's own climb down over NATO membership, hence the new situation that led to RIC's impressive first conference in November 2012. Given the SNP government's predilection for trying to fight referenda on conservative grounds (2012 - drop opposition to NATO, "nothing will really change that much" - and 2017 - defence of the EU, "now let's reach out to the middle classes", i.e. drop more radical policies), RIC must remain based in this activist layer, which now includes many amongst the ordinary and much expanded membership of the SNP (their influence was shown in their ability to hold the SNP leadership to an anti-fracking line). Quite a few of these SNP activists are concerned at the lack of internal democracy and the top-down control freakery displayed by the SNP leadership and their cohorts of political advisors. RIC remains a cross-party and non-party organisation, whose membership is based only on support for its Five Principles. There may well be differences over strategies of how to achieve these held by particular individuals in RIC. Such differences should be accepted and welcomed. RIC has been able have platform speakers from a wide variety of organisations and bring people together to discuss differences in a non-sectarian spirit. We should neither suppress debates over controversial issues, nor let these become political point scoring exercises, acrimonious and personalised. 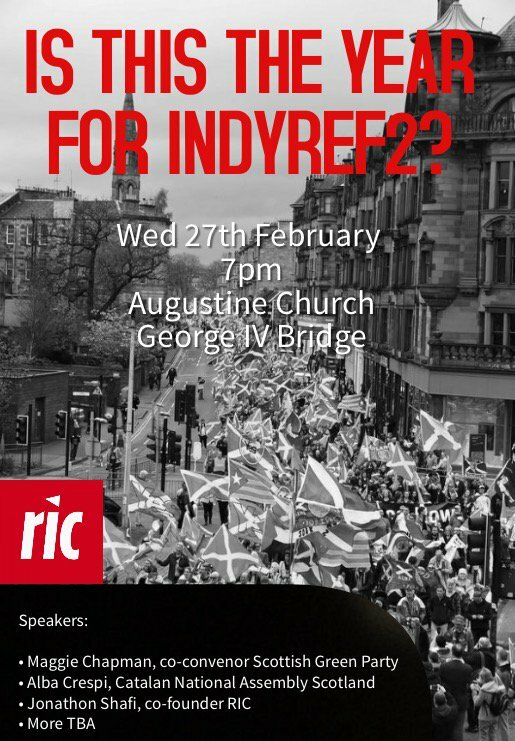 RIC's ability to set up debates in a genuinely democratic way was demonstrated in the debates over Brexit membership (and RIC-Edinburgh's ability to hold well-attended city wide hustings before the 2016 Holyrood elections). It was suggested that we should also to look into the relationship between RIC and other independence campaigns. J.S. said that RIC already had place on the Scottish Independence Convention mark 2. One break-out group emphasised the importance of responding to the rise in racism. The position of migrant workers had become more precarious since the Brexit vote. Scotland is affected by this too. The degree to which the SNP will be all-dominant in IndyRef2 was also discussed. Although the SNP is probably the most centralised and disciplined party in the UK at present, there are still large numbers of new members who are more open to discussion and involvement outside official SNP auspices. The dismissal of the SNP as Tartan Tories by various Left unionists (including sections of Scotland's Corbynista intake) is ludicrous, given the record of the Labour Party (in Better Together and in various Westminster votes). (Indeed many of those who have joined the Corbynistas in England are very similar in social outlook to many of those who have joined the SNP in Scotland). Socialists should not be dismissive of the whole SNP membership. One of the reasons for many on the Left being pulled into SNP in Scotland, or the Labour Party in England, has been because of socialists own divided and often sectarian legacy (e.g. the post-Sheridan fiasco). It was suggested that when it became clearer when the date of any referendum was going to be an attempt should be made to target previous 'No' areas to build support there. Nobody had questioned J,F. 's introductory comments. Several contributions amplified his points. None of the suggestions raised in this session led to any real disagreements. They could form part of a RIC strategy paper to be put to a future national meeting, after local groups discussed them. There was now a strong possibility of the Tory government denying any new Scottish referendum. (Just as they have already dismissed the possibility of a Northern Ireland Border Poll, which the Good Friday Agreement provides constitutional provision for). The Tories clearly don't want to fight a multi-front constitutional battle. Their efforts are concentrated on the Brexit negotiations. They haven't dismissed a future Scottish referendum outright, saying that the results of the Brexit negotiations need to be concluded first. However, it is pretty clear that their real strategy is to delay things until after the next 2020 Holyrood elections, hoping that the record of the SNP in office, in relation to education, health, welfare, etc., will lead to the end of a pro-independence majority in Holyrood. There are some indications that the SNP leadership maybe prepared to accept a delay in a referendum beyond 2018 or even 2020, if a date can be agreed with the Tory government. If this turns out to be the path the SNP leadership chooses, this could provide a political opening for RIC, since many SNP supporters will be very unhappy about this delay. (Furthermore, any Westminster sanctioned future post-Brexit referendum, would exclude EU residents in Scotland, just as the Brexit referendum did for the whole of the UK. This slip from civic to a more ethnic nationalism would be a politically retrograde step. This has already led to the emergence of groups like Scottish Resistance and letters to The Nationalto restrict the franchise in any future independence referendum. Furthermore, the hard line approach being maintained by the Tories has a countervailing effect, which RIC could organise round. Ever since the announcement of the invoking of Article 50, May has fallen back more and more on the UK states anti-democratic Crown Powers, by trying to deny the devolved assemblies and even Westminster any role. The Brexit leaders' 'Take Back Control' is showing itself to be mechanism for reinforcing the most reactionary aspects of the UK state. In IndyRef1 we were up against conservative unionists wanting to defend the Devolution-all-round status quo. They were able to masquerade as liberal unionists, using Labour's post-1997 record and Cameron advancing devolution as recently as the 2011 Welsh Assembly Act. Now we face a reactionary unionist anti-independence Tory government (before this, reactionary unionism only had a majority in Northern Ireland). Reactionary unionists are quite prepared to undo elements of the Devolution-all-round settlement, and attack existing powers. 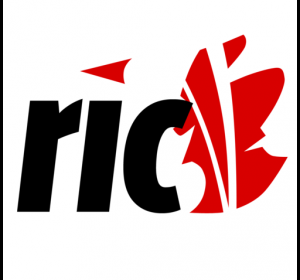 A suggestion was made that RIC should be beginning a campaign, which publicised every instance when May's government overrode Holyrood, (and Cardiff Bay, Stormont, and even Westminster), building up to the possibility of a demonstration later in the year demanding real democracy and the right to hold an independence referendum. It was suggested that the Tories would be looking closely at the situation in Catalunya, where the Spanish government had been denying an official independence referendum for some time, and has now gone as far as removing senior Catalan nationalist politicians from their office. It would be possible to invite people from the Catalan independence movement, whom we'd made links with in IndyRef 2, to address a demonstration. There was also the possibility of inviting somebody from the Border Communities Against Brexit, since the Tories obviously saw the Scottish and Northern Irish/Irish challenges as linked. Another contribution said that any such build up should also be making a more general democratic point. The Tory government was using the state's powers to railroad through a whole battery of anti-social measures, which directly affected the working class, without any parliamentary mandate. This was followed by two more general points, It was argued that the emphasis needed to be on class rather than the more nebulous appeal to Scotland. Another contribution argued that RIC's approach should always be bottom-up, with focus on community and local activists rather than 'the great and the good'. Another contribution argued that we shouldn't be afraid of invoking Scotland, but should put forward our own alternative view about how we saw Scotland's future - Another Scotland Is Possible. There was then another suggestion that RIC should act as a focus for all democratic and social opposition across the UK, and push for a demonstration outside Westminster, inviting people from England and Wales to join. Another person expressed their reservation about focussing first on Westminster, without having built up a strong presence in Scotland first. In this session there were two main proposals, although they were not necessarily contradictory. (If both were accepted, the question of timing became important) However, there were also qualifications, about both proposals, which will need to be addressed). These contributions too could form part of a RIC strategy paper to be put to a future national meeting, after local groups discussed them. N.G. (RIC-Edinburgh) put forward a specific proposal, which was for RIC to organise Another Europe Is Possible conference. In support of the proposal that RIC organise 'Another Europe Is Possible 'conference, it was pointed out that this was the middle slogan in RIC's Another Scotland, Another Europe and Another World Are Possible. During IndyRef1 RIC had a good record of organising speakers from England, Wales, Ireland (both sides of the border), Catalunya, Euskadi, Greece Spain and France, as well as sending speakers to these countries. RIC played a prominent part in demonstrations in support of the Greek people facing the EU leaders' draconian austerity measures. Speakers should be drawn from such sources, as well as from migrant workers living in Scotland. However, Brexit referendum had led not only to Little Englandersim, but to a certain Little Scotlandism, which thought that you could ignore the wider international context, and concentrate all efforts on Scotland in the next IndyRef2. Developments in Europe and the wider world would likely have a bigger effect on IndyRef2 than on IndyRef1. The world is now an even more polarised and volatile place, with people of many political persuasion looking to international precedents to bolster their politics, e.g. the populist Right looking to Brexit, Trump (Brexit plus, plus, plus) and on to Marine Le Pen (Frexit); (the Far Right organising conferences, particularly in Hungary, where Jobbik is strong); and the SNP trying to cultivate high level EU member state contacts. It was important that RIC is able to project its own internationalism, since the ability to do this would have a big impact on the outcome of any IndyRef2. . This did not necessarily mean giving support to the EU. Its leadership had abandoned any pretence of creating a united Europe, which could advance the interests of the majority, and now used the EU only to defend the interests of bankers and corporations. This was highlighted most drastically in its treatment of Greece (but also in Spain, Portugal, Italy and Ireland). It was time for the Left to project its own version of European unity, which could benefit the majority. a) When RIC was at its height from 2012-14, there were supporters who saw their role as only maximising the 'Yes' vote, and, in effect, reaching the parts the SNP could not reach. They placed far less emphasis on developing or putting over RIC's own distinctive politics. Where these people had formed a majority it became harder to sustain local groups after September 18th, 2014.
b) There were RIC activists with experience in a large number of campaigning organisations. After the fall-off in activity in 2014, many of these had gone back to their campaigns, or joined new ones. Many others had joined or gone back to activity in political organisations (e.g. the SNP, Greens and RISE), although some members from all these organisations continued to be active in RIC. Where local groups had been sustained, this did not depend on population size, as the experience of Angus & Mearns, East Kilbride and Inverness showed. It would be useful to find out how this had been done. RIC-Edinburgh, which and been the first local group, has sustained itself in the following manner. i) has meetings which are divided into two parts. The first always consists of a particular topic. These have always been very wide ranging - see http://radicalindyedinburgh.blogspot.co.uk/2015_12_01_archive.html) with invited speaker/s followed by break-out discussions. The second part always consists of organising particular activities. ii) acts as clearing house for whole number of local campaigns, sometimes with members taking leading positions, other times participating in the campaign activities, and taking the banner to demonstrations or day- events. iii) has a card-carrying membership of 108 members, made up of anybody who agrees to RIC's Five Principles. They are kept fully informed of all RIC-Edinburgh and RIC-National business by e-mail. There is a wider contact list of over 600 who are informed of RIC's public activities. RIC-Edinburgh blog is linked to the national blog. iv) has also been able to host three national events, including a RIC conference and two Scottish Radical History days. RIC-Edinburgh thinks that, with modifications due to area size, this could provide a good model for establishing new groups. However, RIC also needs to draw on the experience of other local groups, which have also sustained themselves. It was agreed that the existence of local groups should not be taken for granted. a) Try to find all the remaining contact lists to see if the areas where these people live has been given. Where there are clearly names from a common area, these should be collated. b) Contact existing local groups could also provide e-mail addresses of their supporters. c) When this has been done, tours could be organised to establish or re-establish local groups (with various forms of local advertising to supplement already known people). d) The people speaking at these meetings should be drawn form a wider pool than has been used up to now. e) The immediate purpose of these meetings should be to discuss the proposals coming from this AGM, so that the local groups have an input into the meeting planned for August. f) Model/s for sustaining local groups should be suggested at these meetings. g) There should also be an emphasis on trying to draw in a new layer of activists, as was done very successfully in IndyRef1. It was agreed that a Strategy Working Group should be formed to prepare a paper for a conference in August, using today's discussions. Others are welcome to join this group.